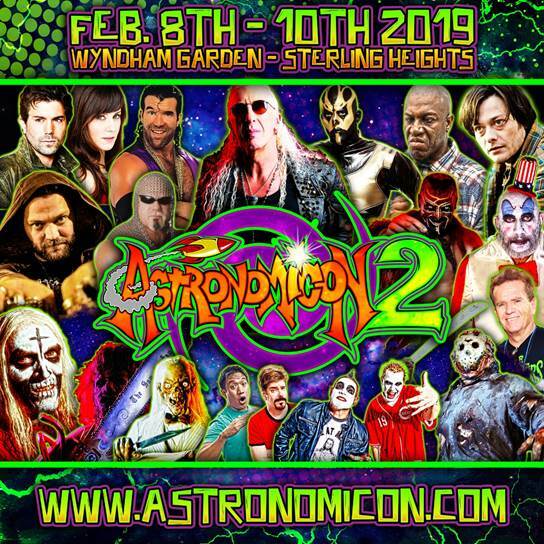 ASTRONOMICON 2 Is Coming To Sterling Heights, Michigan On February 8th-10th! Looking for something to do in the Detroit, Michigan area the weekend before Valentine’s Day?? I’ve got you covered. Actually……the guys from the hip hop duo Twiztid have you covered with their ASTRONOMICON 2 convention in Sterling Heights, Michigan on February 8th-10th! Wow. I am definitely jealous that I will be stuck in California and not at the convention! You see the promo pic there? I’m sure you’ll spot a few of your favorite icons from movie and wrestling fame. And you know what? Some of them will be doing photo-ops in character! That’s right – you can get a pic with Bill Moseley as Otis Driftwood, Sid Haig as Captain Spaulding, one of my favorite wrestlers of all time (because of the horror theme) The Boogeyman will hopefully be eating worms while taking pics…….and speaking of wrestlers, how about a photo-op with none other than glittery Goldust himself aka Dustin Rhodes! Head on over HERE and check out more info on the other guests, panels, and contests for ASTRONOMICON 2. Oh did I mention Linda Blair is going to be there? Yeah. Get your tickets now!